Lianne Chung is an associate in the firm’s litigation department. Ms. Chung’s areas of practice include commercial, construction, and real estate litigation. Ms. Chung graduated from the William S. Richardson School of Law, where she earned a CALI Excellence for the Future Award for the highest grade in Advanced Torts & Insurance Law. While attending law school, Ms. Chung served as an extern for the Honorable Karl K. Sakamoto (retired) of the First Circuit Court of the State of Hawaii, the Honorable Richard R. Clifton, Judge for the United States Court of Appeals for the Ninth Circuit, and the Honorable Lawrence M. Reifurth of the Intermediate Court of Appeals of the State of Hawaii. 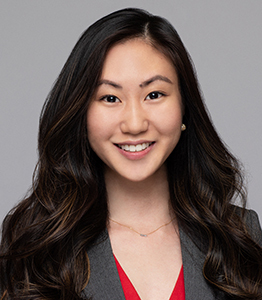 Additionally, Ms. Chung was a member of Richardson’s Native American Moot Court team for two years, and competed in the National Native American Law Students Association Moot Court Competition. In her third year, Ms. Chung and her moot court partner received the First Place award of Best Written Advocate for the best appellate brief to a tribal supreme court, and advanced to the semi-final round of oral argument portion of the competition. Their brief is published in the American Indian Law Review, Volume 42, Number 2. Prior to law school, Ms. Chung served as an intern to the Honorable Rom A. Trader of the First Circuit Court of the State of Hawaii, and worked at the Department of the Attorney General of the State of Hawaii in the Education division. Ms. Chung holds a B.A. in Economics, and a minor in Philosophy from Chapman University in Orange, California.